No, this is Do-mi-NEE-ca, a Caribbean island where the beaches are still empty and the rainforests still secluded. No huge, sprawling resorts here; instead, you’ll find a slower pace, friendly locals, dirt roads, and tropical gardens. This island–affectionately called “The Nature Island”–is truly a treasure. Measuring in at less than 300 square miles, it’s also totally feasible to drive the perimeter of the island, soaking up its main cities and its off-highway gems in a few short days–which is what we, two female travelers in search of adventure, decided to do. We stayed at a no-frills Airbnb in Trafalgar to serve as our base for exploring the sights surrounding the colorful capital of Roseau. We hiked to Trafalgar Falls from the house in the middle of town. from a guide (around $5 USD). Floating through Titou Gorge. The calm before the storm — at the end of this tunnel, churning waters await that defy steady camera handling! 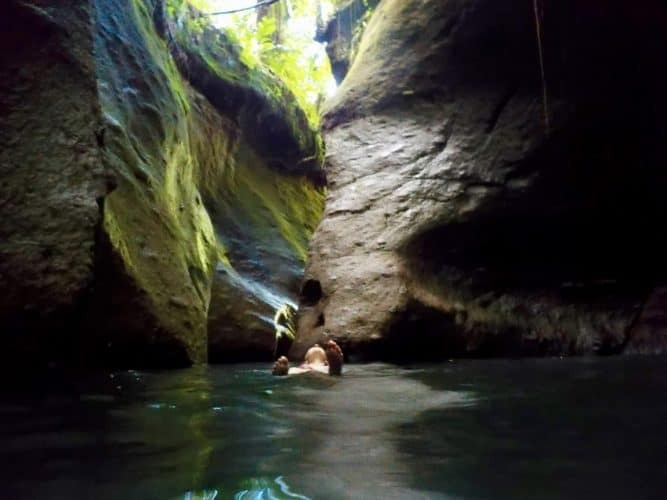 From there, it’s a short (though harrowing) drive to mesmerizing Titou Gorge, which moviegoers may recognize from Pirates of the Caribbean: Dead Man’s Chest. We rented a life jacket for a few dollars at the tables out front. A chilly, cavernous swim took us to the waterfall. On the way back, we bought a fresh passionfruit juice from the same woman renting out the life jackets. 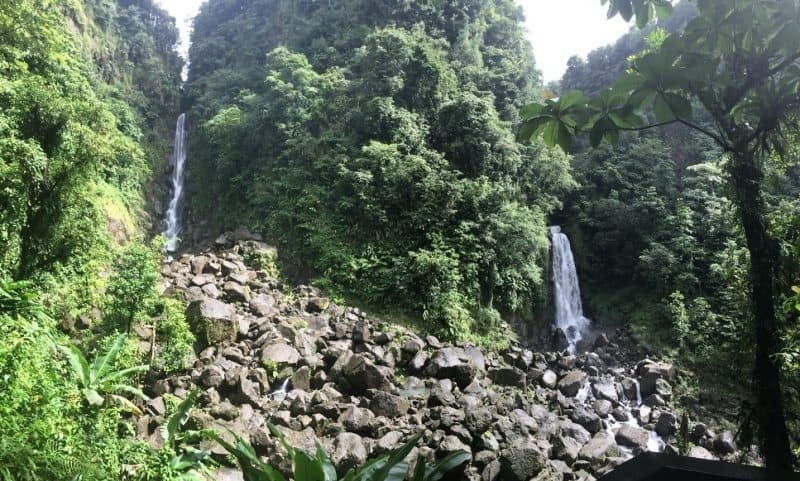 Dominica is smothered in tropical fruits, the gardens bursting with starfruit and mango, and we ate as much fruit as we could–often from right outside the window of our Airbnb. This volcanically-crafted island is also full of geothermal delights. The famous Champagne Reef was too cloudy for snorkeling, so we opted for the lesser known Bubble Beach Spa instead. Trafalgar’s swimming hole provides refreshment after the humid hike to the falls. a natural hot tub of their island. Small restaurants cluster along the road cooking up fresh fish to enjoy after a dip here. Pair it with the island’s famous rum punch–as long as someone else is driving, because you won’t be able to after one of these! 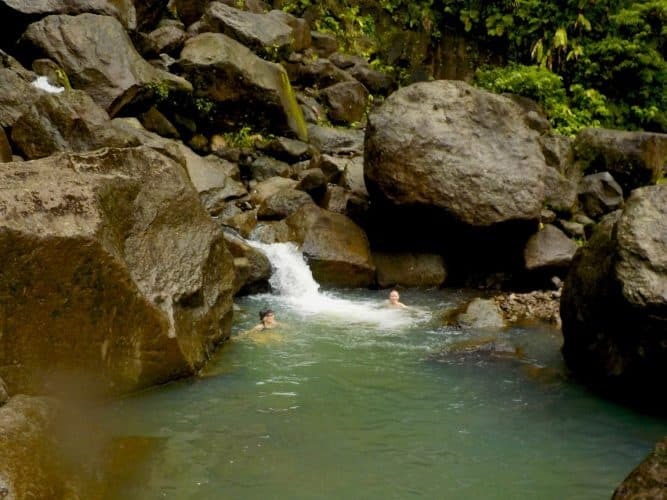 Dominica has plenty of classic white sand beaches as well, but you won’t be sharing them! We stayed at Calibishie on a cliff overlooking the ocean and didn’t see another soul on the beach the entire time. After a swim, we headed into town to the oceanside Coral Reef Bar & Restaurant for some fried lionfish. When we first arrived in Trafalgar, we struggled to find our Airbnb host. It was completely dark, and we were arriving several hours later than we had told our host thanks to the delayed flight and an impassable highway that required significant re-routing of our trip. We stopped at the local watering hole to ask for help–seriously, it was called “Water Bar.” The whole place knew who he was, and one of the patrons even hopped in our car to help us look for him. Bubble Beach Spa is unlike other spas you might find throughout the Caribbean; this one is truly all-natural. We drove all over the winding roads of that town, stopping at Jimmy’s father-in-law’s house and the one house party happening that night, while our new friend asked everyone about Jimmy’s whereabouts. With each and every dead end, he said, “Don’t worry, we will find him. Trust me.” That level of relaxation is what Dominicans are all about. Don’t stress while you’re here; you are surrounded by new friends who want to share the wonders of their island with you. And he was right; we eventually found Jimmy, sound asleep but easily roused to let us into our house for the night. 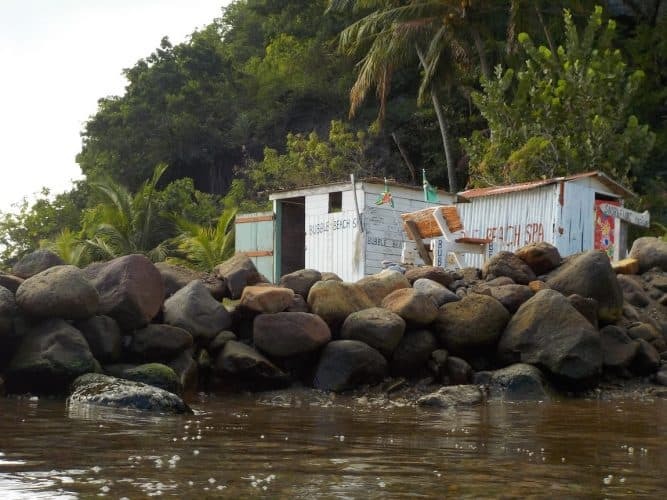 We took a flight from San Juan, Puerto Rico to Marigot, a city in the northeast of Dominica. We arranged a rental SUV online through Expedia before landing, which I recommend; the airport is small and you can’t count on the rental desk being open when you arrive. Our flight was super delayed after being re-routed through Antigua, so we were glad we had someone expecting us–and someone to give us a few pointers on Dominican driving! You will drive on the left-hand side and need a good dose of patience; you may be navigating some rough terrain. Driving here is worth it for the opportunity to stop at roadside waterfalls, like Sisserou. Colorful hand-painted signs welcome you to a short hike down to the falls. We had the whole place to ourselves. On this trip, we quite often had the place to ourselves. Trafalgar’s twin waterfalls spilling from the volcano-made mountains. We rarely met other tourists, so we got to soak in all of this rain-drenched beauty by ourselves. 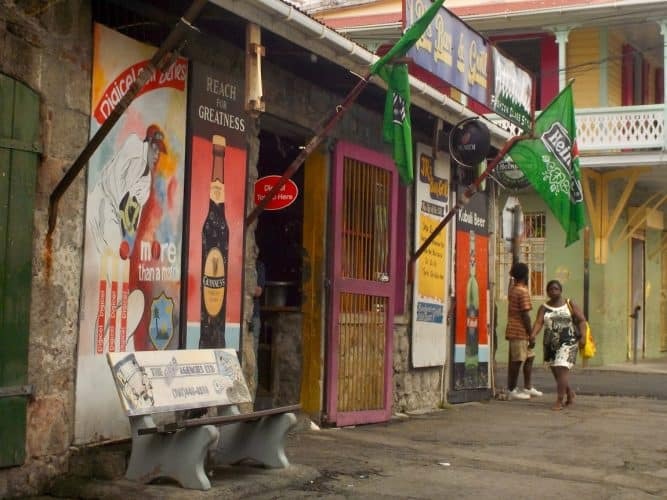 If you’re looking for an authentic, charming Caribbean experience, the people of Dominica will welcome you with open arms, a fresh passionfruit from the garden, and a sweet, strong rum punch. 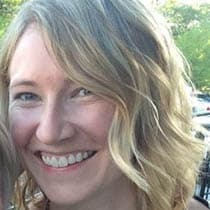 Caroline Sumners is a middle school biology teacher in Atlanta, GA. She uses her school breaks to explore the world, especially places with interesting wildlife so she can share what she learns with her students. When at home, she reads voraciously, practices yoga, and spends time outdoors with her two dogs.